Regional conferences are designed to allow TSA members to hone their skills, and to receive feedback for improving projects before attending Tennessee TSA's State Conference. Attendance at a regional conference is not required to advance to State Conference. Tennessee TSA's West TN Regional Conference has been cancelled for 2019. All registered schools have been contacted via email with available options. Any questions or concerns can be directed to Dr. Brittany Debity-Barker, director of student leadership. If the facility hosting the event is closed or operating on a delayed schedule, the regional event will be postponed. If the school system in which the regional event is held is closed or operating on a delayed schedule, the regional event will be postponed. If more than 35% of the school systems competing in the regional event are closed or operating on a delayed schedule, the regional event will be postponed. To receive text updates for the Tennessee TSA Regional Events, please click here. 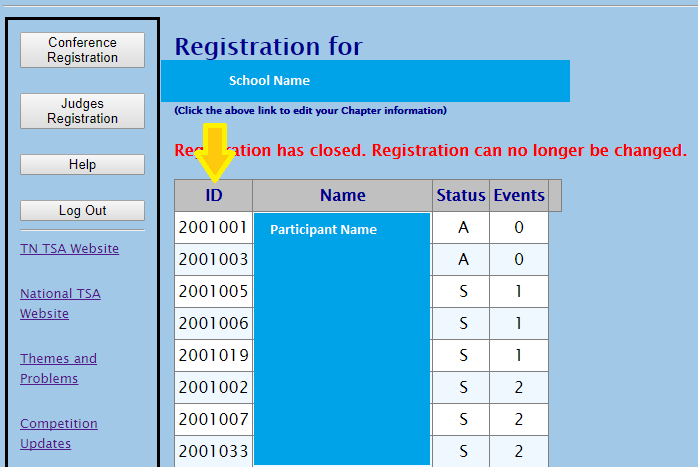 ​You can find your students participant ID numbers when you log into the event registration system. The image below shows a sample screen shot of what your roster looks like. The yellow arrow points to the participant ID numbers. The first four numbers are your chapter ID. The full number next to a students name is their participant ID number.